Ruth Gikow was born in the Russian Ukraine and emigrated to the Lower East Side of New York when she was 5. At age 17 she entered the Cooper Union Art School and studied with Austin Purvis, Jr. and John Stewart Curry. After art school she joined the New York city WPA Federal Arts Project. In 1939, she was commissioned to paint murals for Bronx Hospital, Riker's Island, Rockefeller Center and the New York World's Fair. She also created illustations for World Publishers' edition of Dostoevski's Crime and Punishment. With associates, she helped found the American Serigraph Society which produced a substantial body of original graphics. when she and her husband travelled to Europe to study the works of the Old Masters, the wall paintings of Pompeii and the Byzantine mosaics at Ravenna. Though she lived through turbulent and sometimes hostile times, her work continued to reflect her strong love of humanity. Her lifelong dedication to an original and authentic vision led art critic Henry Russell Hitchcock to describe her as one of the country's "ten outstanding women painters." 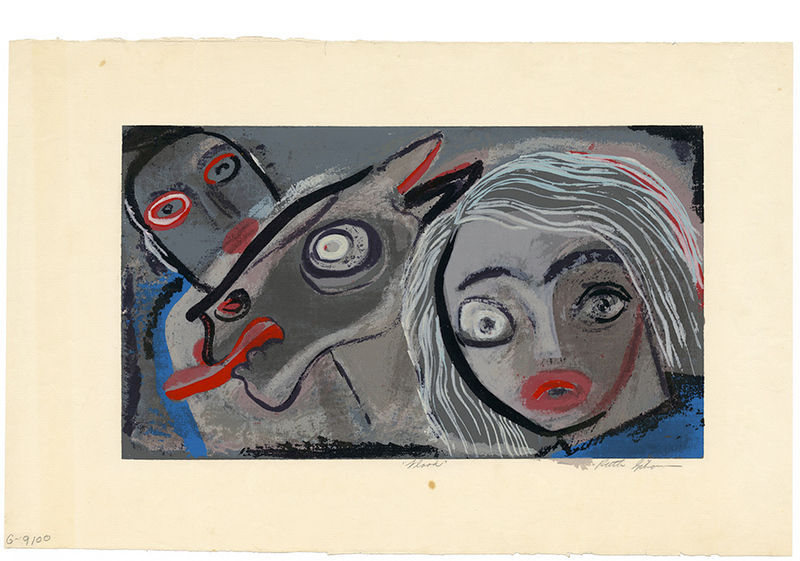 Gikow's work is represented in numerous public collections including, the Metropolitan Museum, Museum of Modern Art, Smithsonian Institution, Philadelphia Museum of Art, Whitney Museum, Portland Museum of Art (Maine), National Institute of Arts and Letters, Museum of Fine Arts, Springfield, MA, Hartford Art Foundation, and the Butler Art Institute, Youngstown, OH. 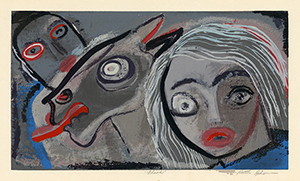 Psychosis - Two Napoleons and a Josephine - c.1937, Color Serigraph. Edition c. 25. Signed and titled in pencil. Stamped NEW YORK CITY WPA ART PROJECT in the lower left margin; numbered 12 in pencil, in the bottom right sheet corner. Image size 13 1/4 x 10 inches (337 x 254 mm); sheet size 17 1/2 x 12 1/2 inches (445 x 318 mm). A fine impression, with fresh colors, on cream wove paper; full margins (1 1/4 to 2 1/4 inches), minor creasing to the sheet, otherwise in excellent condition. Created for the New York City WPA. 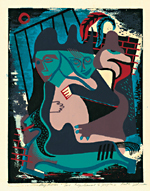 Exhibited and reproduced: Paths to the Press; Printmaking and American Women Artists 1910-1960; Elizabeth Seaton, editor; 2006. Collections: Metropolitan Museum of Art; Smithsonian American Art Museum (gift of Audrey McMahon, Director, New York City WPA); Belverd and Marian Needles. The subject image is an allusion to the psychosis wherein mental patients believe they are famous historical figures. 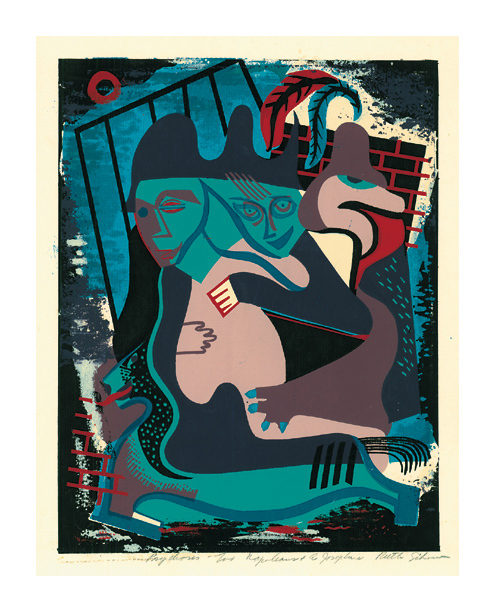 Flood - c.1939, Color Serigraph. Edition c. 25. Signed and titled in pencil. Annotated with the WPA number G-9100 in pencil, lower left sheet corner. Image size 9 5/16 x 16 3/8 inches (237 x 416 mm); sheet size 14 3/8 x 22 1/8 inches (365 x 562 mm). A fine impression with fresh colors, on cream wove paper; full margins (2 3/8 to 3 1/4 inches). Scattered soft creasing and a repaired tear (1/2 inch) in the top center sheet edge, well away from the image, otherwise in good condition. Collections: Metropolitan Museum of Art, New York Public Library.